The Joint Foreign Chambers (JFC) will be hosting the Annual 15th Joint Foreign Chambers Networking Night. This will be held on Thursday, 27 September 2018 from 6:00 pm to 9:00pm at the Mayuree I Ballroom, Dusit Thani Manila, 1223 Epifanio de los Santos Ave, Makati, 1223 Metro Manila. This event is one of the highlight networking events in Manila for the year and is created to provide an opportunity for our respective members and honored guests to meet and network in an informal setting. Relationships formed at an event like this help stimulate discussion and possible business opportunities. 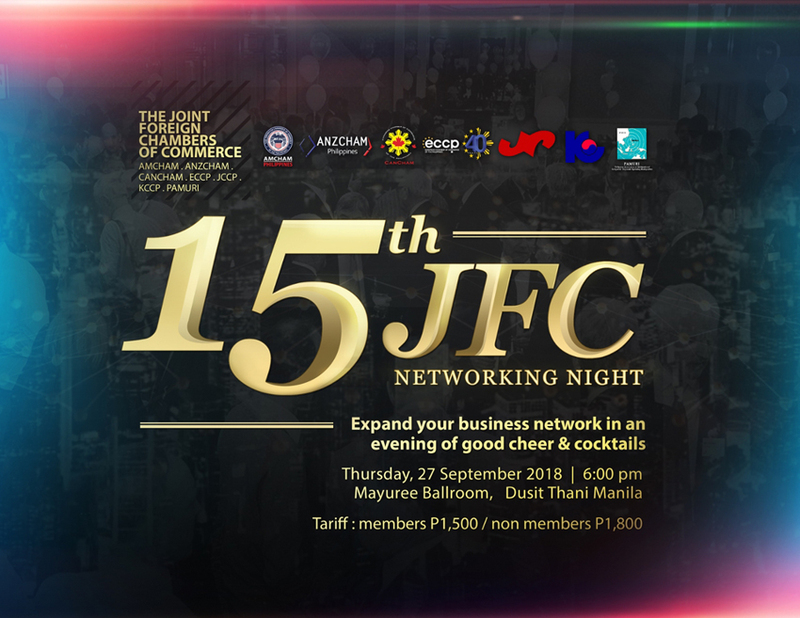 The JFC Networking Night attracts over 300 guests, composed of the members of the different foreign chambers, prominent figures in the business and diplomatic world, and top government officials. at meluz.malantic@eccp.com or call +63 845 1324.